Dog obedience is essential for a successful co-existence with people. A puppy’s basic training is begun by its mother and should be continued when the puppy’s new pack leader,the owner, takes on responsibility for the new puppy. Dog obedience is the development of a dog’s natural willingness to please. Through reward and praise dogs learn to link commands with required behaviour. Obedience training is not bullying! Obedient dogs are fulfilled and a pleasure to have around. A background of caring for dogs and an understanding of their psychology and behaviour is necessary. Although there is no legal requirement for a dog obedience trainer to have qualifications, it would be inadvisable-at least-irresponsible and dangerous-at worst-to set upin business as a dog trainer without them. Experience of obedience training is also essential. There are various day and diploma courses in Companion Animal Behaviour and Business Therapy available. It is possible to study for an Accreditation for Dog Training and Behaviour and there is a British Institute of Professional Dog Trainers. With professionalqualifications the dog obedience trainer is more likely to gain a licence from local authorities,where needed, and have the relevant insurance to run successful classes. Teaching dog obedience could also read ‘training dog owners’ in some cases. Having an obedient, well-trained dog is half the partnership; teaching owners how to ask for obedienceis another matter! One obvious mistake that trainers have to deal with quite often is when handlers inadvertently reward unwanted behaviour instead. If a dog keeps barking, the ‘untrained handler’ may feel embarrassed and give the dog attention, maybe even a treat, to keep it quiet; the dog reads this as a reward for barking, so the behaviour is repeated. 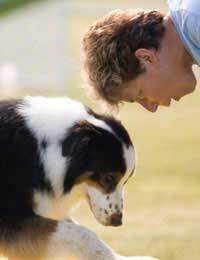 The obedience trainer must teach the dog’s handler how to encourage appropriate behaviour. Classes are run in halls, barns, anywhere that has the space and confinement needed (with attention to relevant Health & Safety details.) Trainers may also offer one-to-one sessions to help with specific issues in the dog and its handlers’ home, and some have the facilities to board both dog and handler, for more intense training. Helpers are invaluable at group training sessions in order to assist the trainer in demonstrations that need more than one pair of hands. It is also to be expected that, with puppy classes especially, there will be the occasional puddle (at least) on the floor! These helpers are normally prepared-with rubber gloves, mop, disinfectant and towel. Word of mouth and local advertising are generally how trainers promote themselves. Agood reputation as a trainer takes time to build. Along with having successful results with dogs, it is important to be a good communicator with a friendly disposition. Some trainers take their own obedience dogs to the classes they teach as a further incentive and talking point. They might do a demonstration with their dog-and encourage the less confident handler to work with it-to help them in handling their own dog. Wages are low and expenses need to be considered when running classes-hire of venue,lighting, insurance, cleaning materials and cost of helpers at least. As with most jobs involved with animals, the work can be physically and mentally demanding, but it is not‘just a job’, more of a vocation! Trainers can advance their skills by further study and greaterpublic exposure, if that suits them. Teaching dog obedience requires patience and a genuine desire to help people understand their dogs for the benefit of both. It can be dangerous occasionally so a calm, quiet, but confident nature is an asset and good communication skills essential. Working with anuntrained dog and handler, to watch them develop together from the beginning to their first obedience competition, is an extremely satisfying experience!